Under the patronage of H.E. Shaikh Khaled Bin Humood Al-Khalifa, Chief Executive Officer, Bahrain Tourism & Exhibitions Authority (BTEA), in cooperation with the United Nations Industrial Development Organisation (UNIDO ITPO Bahrain), the Arab International Centre for Entrepreneurship & Investment (AICEI), the MENA Centre for Investment, the Franchise Association of the Middle East (FAME), the strategic partner Tamkeen, and association partners, the organisers Quick Media Solutions Company W.L.L (QMS) held a press conference on Thursday, 24th January, 2019, at Bahrain Conference Centre – Crowne Plaza Bahrain to announce the launch of the first edition of the International Brands and Franchise Expo 2019 (IBFEX 2019) in the Kingdom of Bahrain. The launch was attended and supported by delegations from business NGOs and association partner; Small & Medium Enterprise Society (SMES), and Bahrain Business Women’s Society (BBWS). The Expo, taking place between 11th – 13th February, 2019, is significant to local, regional, and international investment; highlighting franchising as a method towards promoting investment and trade facilitation between countries, while fostering improved economic development in both target and destination locations through the franchisor and franchisee. Franchising has become a process of integrating economy, culture, and governance across national borders. Empower entrepreneurs with knowledge and tools towards developing Franchise concepts. Mr. Benoy Kumar, Chairman of the organising company; Quick Media solutions (QMS), stated in his press launch welcome address that: “IBFEX 2019 is an exclusive expo focused on brand awareness, development, expansion and networking. This expo welcomes brand owners from various sectors to showcase their brand ideas, innovations and trends to the business market to claim new business opportunities and grow their business brand to an expansion model. Mr. Kumar also stressed that “with the sustenance provided by our supporting partners, this event will be focused on delivering a wide spectrum of solutions and support to all the entrepreneurs and enterprises across the MENA region”. Mr. Jacob Jijo Philip, Director of Marketing and Exhibitions at Quick Media Solutions Co. W.L.L. (QMS) and member of the Expo Organising Committee, delivered an introductory speech on behalf of QMS team. Mr. Philip outlined the main objectives of the expo saying: “We are on a mission to make IBFEX 2019, in the kingdom of Bahrain, the hub of opportunities for global business networking”. The patron’s keynote speech was delivered by Mr. Fawzi Tulefat, Director of Exhibitions and Conferences Marketing and Promotion of Bahrain Tourism & Exhibitions Authority (BTEA). Mr. Tulefat conveyed the greetings of H.E. Shaikh Khalid Bin Humood Al Khalifa and his warm wishes to the organisers, partners, supporters and participants to succeed in their endeavours to achieve the sought objectives from this Expo. Dr. Hashim Hussein, Head of the United Nations Industrial Development Organization (UNIDO – ITPO Bahrain) and the Arab Centre for Entrepreneurship & Investment, statement: “We wish to express our gratitude and thanks to His Excellency Shaikh Khalid bin Humood Al Khalifa, the Chief Executive Officer of the Bahrain Tourism and Exhibition Authority for patronizing the event, as well the event organizer and the sponsors, partners, associations and everyone involved. This is the first edition of the event, and we strongly believe that it is highly significant to local, regional, and international investment; highlighting franchising as a method for micro, small, and medium sized enterprises towards promoting investment and trade facilitation between countries, while fostering improved economic development in both target and destination locations through the franchisor and franchisee. Franchising has become a process of integrating economy, culture, and governance across national borders. The United Nations Industrial Development Organization, Investment & Technology Promotion office in Bahrain, and the Arab Center for Entrepreneurship & Investment have a key focus on boosting MSMEs and franchising as a means for economic development and promoting investment; evidenced through the delivery of our Enterprise Development & Investment Promotion Program (EDIP) for the past 20 years, today dubbed the Bahrain Model of Entrepreneurship, supporting millions of entrepreneurs world-wide. In addition, we deliver technical programs on franchising, franchise counselling for local startups, enhancing local and regional knowledge of franchising, promoting partnerships, and ultimately initiating the Franchise Association for the Middle East (FAME). With the founding members: the MENA OECD Investment Center in Bahrain and the Lebanese Franchise Association. The Middle East & North Africa’s business climate, with particular significance towards MSMEs, has begun to exhibit signs of maturity and growth in the entrepreneurship sector. This potential, enabled with increasing education and development of entrepreneurs, has led several MSMEs to begin considering Franchising as a way forward towards increased growth (as franchisors). MSMEs with potentiality for franchising are investigating the Franchising spectrum, but with limited information on core franchising practices and minimal education on the subject; MSMEs undergo insufficient preparation on developing their own franchising potential and lack expertise in developing suitable and beneficial Franchising relationships. Furthermore, such entrepreneurs tend to lack effective representation through Franchising Associations in their target country, and on a regional level. Such obstacles hinder opportunities for economic growth and international trade. Moreover, MSMEs contribute to poverty reduction, as they are the main source for economic activity that supports bottom-up economic growth, structural change and innovation. They create employment and generate income for the entrepreneur, the employees and often suppliers, and hence reduce economic and social disparities. Franchising is a promising and natural path of growth for such MSMEs. The above necessitated the launch of the Franchise Association for the Middle East (FAME) in 2012, which provides strong and efficient coordination for franchisors through a network of franchises and similar organizations spreading awareness and coherence to MSMEs. The association involves multiple countries, and aims to empower the franchise spectrum while safeguarding the prime interest of franchisors and franchisees against possible malpractice. The press launch was attended by the founder and chairman of the Malaysian World Chamber of Commerce (MWCC), Dr. Pallakal Nagaraj, one of the main partners of the IBFEX2019. Dr. Nagaraj took an active role in the panel and shared with the attendees his experience and views on franchising. 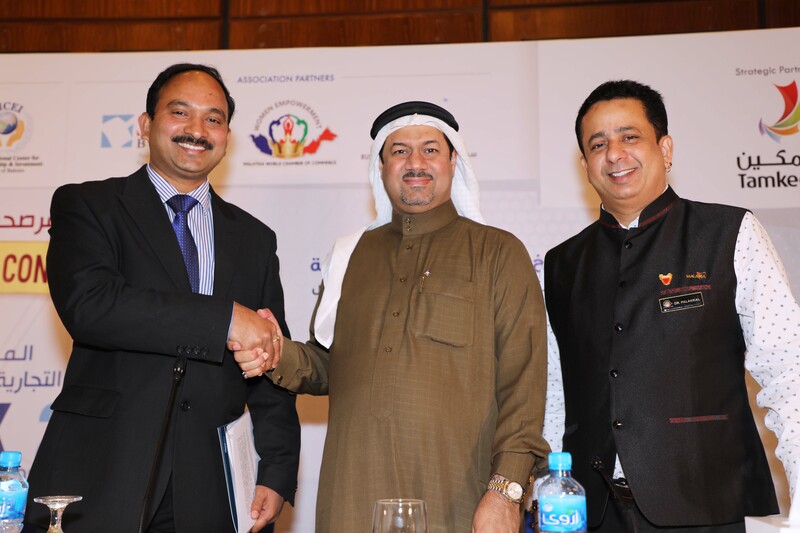 Dr. Nagaraj also stated: “I look forward to participating in this promising event by bringing Malaysian brands to Bahrain to expand across the Middle East, and working with the concerned parties to develop the franchise industry in Bahrain and the region. At the end of the launch ceremony, the organisers thanked all participants starting with the patron, H.E. Sh. Khaled Bin Humood Al-Khalifa, its partners; Tamkeen, UNIDO, UNIDO-ITPO, MENA business centre development centre, BCCI, supporting NGOs and the local Media for playing a positive role in supporting the orgnisers in their efforts to contribute in the development of Bahrain’s local economy by connecting it to the world via its regional and international business partners and global business networking. The organisers also extended an open invitation to all Bahrain enterprises to register to participate in the IBFEX2019, and take advantage of this unique business opportunity and experience.